Worth the wait! Preserved lemons, ready to eat after a month. If you prefer your food bland, skip this blog post. Until now, when I made preserved lemons in the past, honestly, I struggled to use up an entire jar. Classically, you use preserved lemons in chicken tagine but we don’t eat much chicken. They go well with fish but we eat little fish. You can use them in dressing, but we can eat only so much salad. On top of that, my picky eater won’t touch anything fermented (although she finally tried my ginger beer and liked it—mothers of picky eaters, take heart). With their intensely pungent, walloping umami, super salty and complex flavor, you typically add only a small amount to a dish. How could I possibly use up entire jars of these flavor bombs? I stopped making them. Me, with the prolific lemon tree. What a shame. Then at my favorite Indian restaurant one night a couple of months ago, my boyfriend Chandra commented on the delicious lemon in the side of pickle we order with our vegetarian tali every time we eat at Darbar. The pickle I eat about once a month or so. The pickle that I adore. I picked up the pickle. Preserved lemon. Right there. In the small white dish. How could I not have noticed? Within a couple of days, I had two large jars of preserved lemons going on my counter. 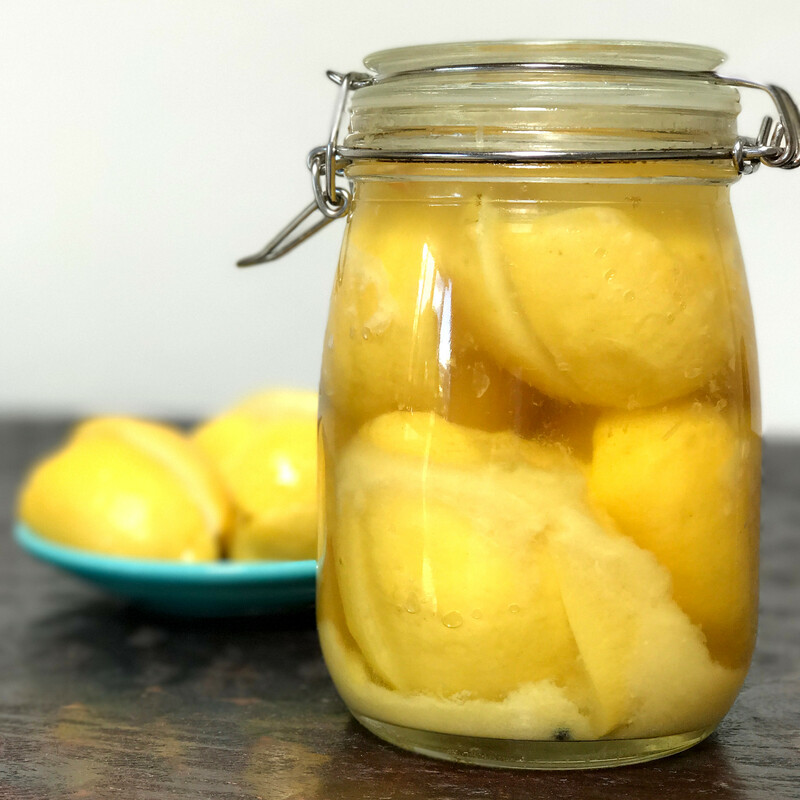 If you can find preserved lemons in a grocery store, they will cost you a small fortune—around 10 dollars for an 8-ounce jar, more for organic. Although they are worth the price, if you have a jar, some salt, a bunch of lemons and patience—these sit for a month or longer—you can easily make them yourself. Because I have a lemon tree, mine cost me basically nothing. 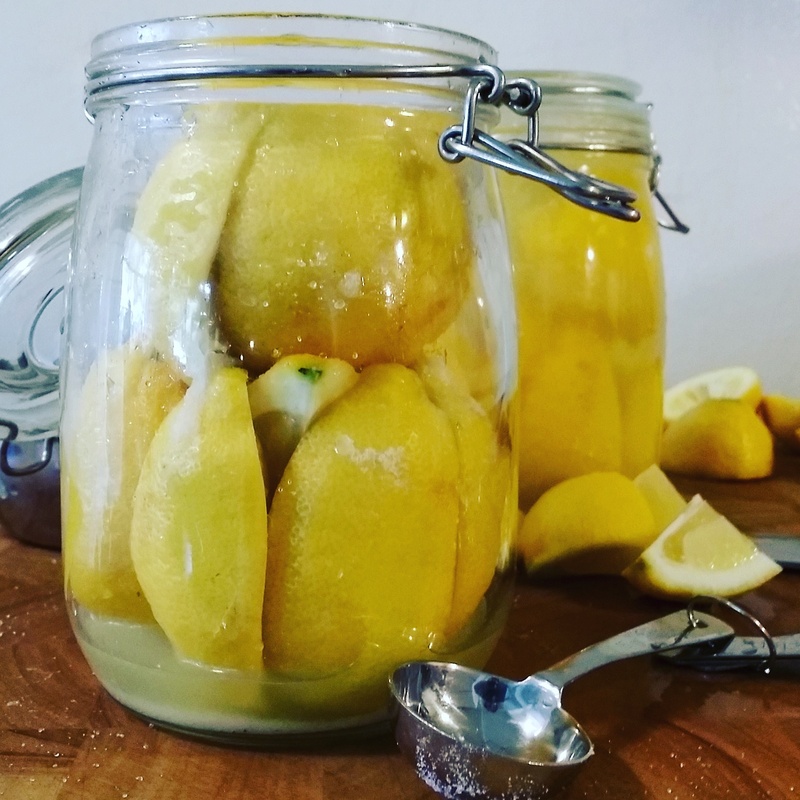 I used about 10 lemons for each 1-liter jar pictured below—six to preserve and four for additional juice that goes into the jar. You can also preserve limes but will need more per jar. Follow the same basic instructions below. Note bene! I use organic lemons from my yard for these. You can find organic lemons at many grocery stores but they may be coated in food-grade wax. If, like me, you would prefer not to eat peels coated in wax, ask your grocer if the lemons have been coated. I have read online that you can pour boiling water over waxed lemons and then scrub off the wax but boiling water will kill the beneficial microbes that you need to ferment these. Recipes for preserved lemons vary. Some call for lemons and salt only. Others call for spices such as bay leaves, cloves, coriander seeds, peppercorns, and cinnamon sticks. For this post, I added some peppercorns—five or six—to each jar before I shoved in the lemons. After I filled the jar, I then put a tiny jam jar (without its lid) on top of the lemons and closed the jar. The lid of the big jar pushes down the little jar, which shoves down the lemons, and causes the liquid to rise and submerge everything. Set the jar aside on a plate to catch any oozing lemon juice. Burp the jar (i.e., open it) every day for the first several days to release any gases building up in there. Wait a month or longer. Use your lemons when the skins have softened completely. Scrape away the pulp, rinse off the salt (depending on the recipe) and add the rinds to your dish. Add it to salsa. Delicious. Chandra makes salsa often so I threw some pulp in there as a test. Yum. Throw it into soup or sauce. If you want to add a complex lemon flavor to a soup or sauce, toss the pulp in in. Simply break it up with a wooden spoon. Add it to salad dressing. Push it through a strainer first or whir the pulp in a food processor and use it all in salad dressing. Add it to hummus. 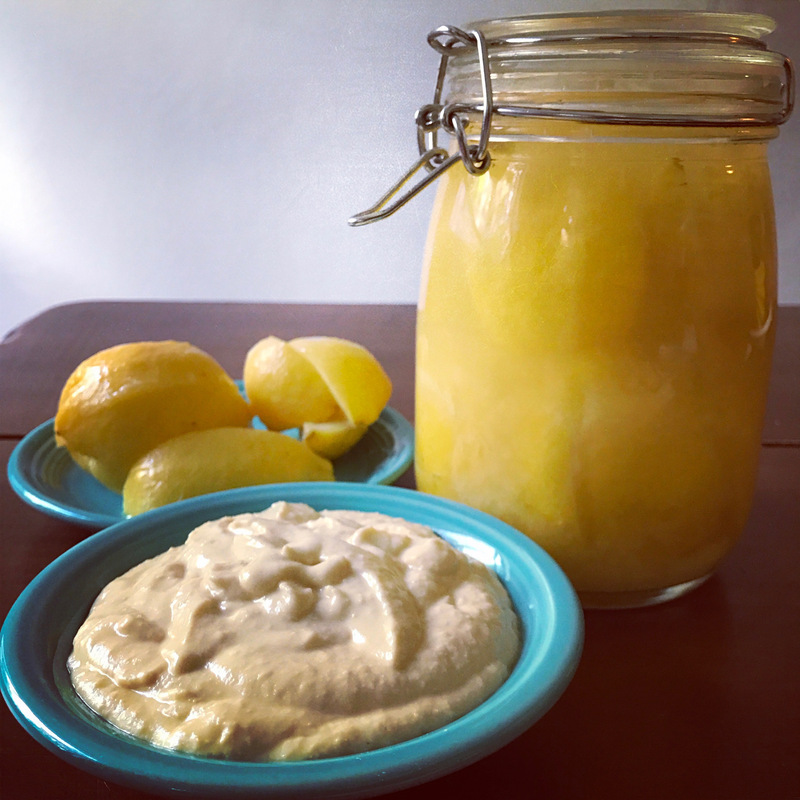 My hummus recipe calls for lemon and salt like most hummus recipes. How delicious would it taste with preserved lemon pulp, I wondered. Very delicious it turns out! (Here’s the recipe.) We couldn’t stop eating it. In short, add the pulp to dips, soups, sauces and dressings that need a bit of oomph. Now I worry about running out of preserved lemons. Chandra and I have been chopping up the preserved lemon peels, mixing them with fermented hot peppers and eating that with my chana masala. So good! All this time, I’ve had the makings of a delicious side pickle and didn’t even realize it! Maybe we’ll just eat in every night. Now I understand why you are not moving back to Canada. No lemon trees. Hahaha! I do love my lemon tree! I didn’t realise these were so easy to make, the hardest part will be finding unwaxed lemons I think! These are around £5.00 for a 300g jar here in the UK, so I’ve never bothered with them. Right, you’d want unwaxed. Thanks for pointing that out. I forgot to mention it in the post (I don’t think about it since I just pick these from our tree). Organic too. When I make preserved lemons I just quarter then and don’t bother leaving them connected on one end. Doesn’t seem to make a difference in the end product and I can put more in a jar. Thanks for this info. That sounds very efficient. When I make mine, one or two quarters will fall off as I stuff the lemons in the jar. They’re always fine. So do you sprinkle in the salt as you go along, packing the jar? Or mix it all up in a bowl first (quarters and lemons)? I’ll try this in the fall when my tree starts producing like crazy again. Wonderful! Thank you for this recipe and all the tips. Pinning till lemons are plentiful next winter. I am somewhat obsessed with preserved lemons. They add so much flavor. And they look so pretty too. Wow, four hours?! :O I didn’t know it could be done. Thanks for the link. Enjoy your lemon-infused dishes. And what do you do with the additional lemons you juice in there? Love your blog! I followed your recipe. After about a week–today–noticed a bit of black mold on top. What am I doing wrong? Should I toss them and start again? Oh and I am using regular lemons, not Meyer so that can’t be it. You can also make a drink out of it. There’s a Vietnamese drink called Chanh Muoi! I have just made these. I’m so excited. I wonder what you could do with the rinds that you end up with for the juice. Do you do anything with these? Thank you so much for your wonderful blog. I am learning such a lot from you! I am trying the recipe with giant kumaoni lemons (galgal). will share the result! Hi! My preserves lemons are ready to use but I’m unsure of how you store them if you are only using one rind at a time? Back in the jar? Separate jar in the fridge? What about a recipe for the Indian pickle that inspired you?!! Sounds delicious!